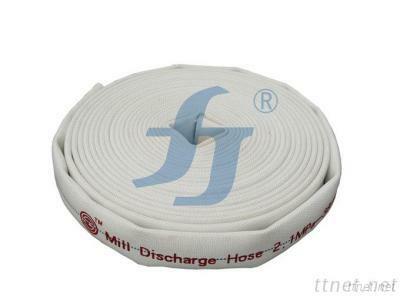 Mill discharge hose is for pump water discharge, washing down service on ships and in factories, cleaning-up and construction pumps in plants. Its warp is made by high strength polyester staple/yarn. You can choose the 20S spun yarn or the 8S thick yarn. And the weft must be high strength polyester filament with low elongation. The jacket should be evenly and firmly woven by circular loom and free from visible defects, thread knots, lumps and irregular twist. The thicker jacket can afford greater abrasion resistance and the ability to reach higher working pressure than the standard one. The rubber lining is very smooth with excellent flexibility, aging proof, sealing property, flame and oil-resistant, acid and alkali proof, wide range of operating temperatures, and so on. It can satisfy demands of special performance compared to other lining fire hose. Commonly used for indoor fire prevention, industrial effluent, agricultural irrigation, industrial and mining enterprise, ships safe and other special fields.